(CNS): Jeffery Alexander Barnes appeared in Grand Court on Friday and was indicted on just one count of indecent assault in connection with an incident in Windsor Park, George Town last October. The 32-year-old George Town man pleaded not guilty to the charge and a trial has been set for 30 July. Although there are several other charges pending against Barnes the judge issued a reporting restriction on Friday’s hearing. Justice Seymour Panton also ordered that a second indictment with a further six counts against the defendant was correctly presented to the court by the director of public prosecution’s office. The further charges which related to two other incidents will be the subject of future court appearances but CNS is unable to report further on this hearing. (CNS): A 35-year-old Jamaican woman who had returned to the country from the Cayman Islands last week is believed to have been murdered by her sister in Portmore, St Catherine. The body of Stacey-Ann Smith, a labourer from Portsmouth in Portmore, was found buried inside a house in the area on Monday. Operations officer for the St Catherine South Division, Superintendent Clive Blair said the woman was last seen alive almost a week ago. Smith’s sister has been arrested in connection with the killing, which a Jamaican police officer described as the most gruesome murder he had ever seen, according to reports in The Jamaica Gleaner. “I mean the body was placed in a crocus bag and cemented in the wall," Superintendent Blair said. The police were called to the scene around noon yesterday after a foul odour took over the community. When the police arrived, the body was found in a section of the building that is under construction, the Gleaner reported. Investigators told Jamaican daily newspaper that people reportedly heard strange sounds coming from the yard but thought nothing of it as construction had been taking place at the property. 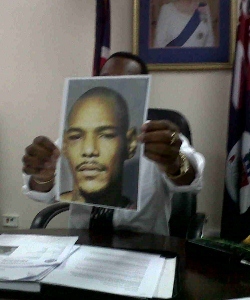 The Portmore police, who are investigating, have yet to establish a motive for the murder. (Daily Telegraph): As the Queen marked the 60th anniversary of her accession to the throne, a visit to a primary school saw her introduced to a class of three and four-year-olds who had put on display several uniquely decorated large pairs of pants. On the historic milestone of her Diamond Jubilee, she could never have expected to come face to face with the Royal Bloomers. The children were inspired by the popular children’s book The Queen’s Knickers by Nicholas Allan, which is about a little girl who imagines what royal underwear the monarch might wear for a school visit. The children had hung seven pairs of bloomers hung from a makeshift washing line in the “Royal Laundry”. 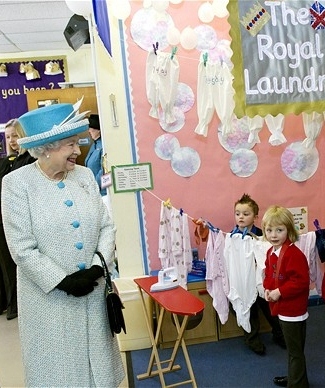 The Queen appeared amused, smiling as she said: “Oh they’re doing the washing”. The 85-year-old monarch chose to mark the start of her jubilee year with little fanfare, taking part in two public visits in King’s Lynn, Norfolk, near her Sandringham estate. But the low-key anniversary will be followed by official celebrations, culminating in a four-day bank holiday weekend in June. 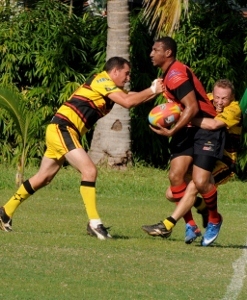 With the Cayman Union expecting to sell nearly 3000 tickets, entry on the day (if any) will be CI$30 per person whilst tickets are available online now at a mere CI$15 and patrons buying online receive a 20% off -official tournament T-Shirt coupon in the mail with their tickets. With Maples and Calder already coming on board and donating 500 youth tickets to the Big Game 1 tickets are already flying out the door and with the day starting at noon and running till 11pm with a schedule featuring local vendors, the Cayman vs. Mexico game at 4pm and an after party featuring DJ XS running till 11pm patrons will certainly not be disappointed! 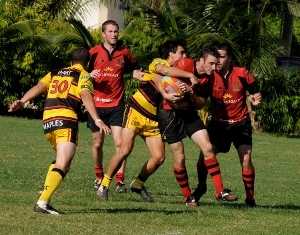 With the DHL Storm looking set to secure the Alex Alexander Memorial Trophy the only thing standing in their way is the Krys Global Buccaneers who know that if they can defeat the Storm this weekend and deny their opposition any bonus points then they should have a real chance at stealing the Cup with only 2 games left in the regular season. With the John Doak Architecture Iguanas and the Queensgate Pigs Trotters now out of the running for the league trophy all their focus is building towards the DART Knockout Vase and no doubt the Pigs Trotters will be licking their lips at the prospect of picking up their first win in over a year over a faltering Iguana side. (CNS): The Centre for Biological Diversity has filed a lawsuit in the US seeking greater protection for threatened coral reefs in the Caribbean. The lawsuit claims that the National Marine Fisheries Service has ignored scientific evidence that parrotfish and other grazing fish play a key role in promoting the health of coral reefs. As a result the suit asserts that government’s authorization of targeted parrot fishing poses a risk to elkhorn and staghorn corals, protected under the Endangered Species Act. “The Caribbean’s coral reefs are already in deep trouble, and reducing the parrotfish that help them stay healthy only makes matters worse,” said Miyoko Sakashita, oceans director at the Centre in a release. According to the lawsuit, the National Marine Fisheries Service violated the Endangered Species Act by finding that the targeted fishing for parrotfish would not jeopardize already imperiled corals or “adversely modify,” in other wordes damage, their critical habitat. Excessive algal growth threatens the health of Caribbean reefs, choking out corals and degrading the habitat that other reef creatures — such as fish, sea turtles and lobsters — depend on. Fish, especially parrotfish, that graze on algae around coral reefs play a key function in providing suitable habitat for corals to settle and build those reefs. 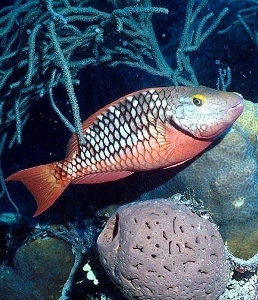 Fish populations in the Caribbean have been overfished, including the parrotfish that are the subject of this lawsuit; managing the overfishing of parrotfish will help corals recover and become more resilient to other threats, including global warming and ocean acidification. Elkhorn and staghorn corals were once the dominant reef-building corals in the Caribbean but they are perilously close to extinction. Corals suffer from a variety of threats, including pollution, global warming and ocean acidification. A key threat to corals, however, continues to be overfishing and competition with algae. The corals have declined by more than 90 percent since the 1970s. In 2006, the two corals were protected under the Endangered Species Act in response to a petition by the Center for Biological Diversity. 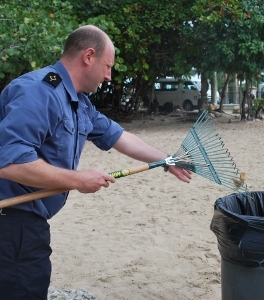 (CNS): Crew from the Royal Fleet Ancillary (RFA) Fort Rosalie helped clean-up recently during a visit to Grand Cayman. Sailors gave staff from the parks and cemeteries unit a hand sprucing up Governor’s beach and Smith Cove despite the rain. “The visit to Grand Cayman was recreational; however, whenever the RFA ships visit, no matter their purpose, they are always willing to assist with community projects,” said Third Officer (Systems) George Counsell. “We thought it might be a nice idea to see if some of the crew could do something constructive on land to improve a small part of Cayman, whether it is building, painting, repairing or general tidying up." the sailor also described the clean up as a "a nice break from the routine of the ship" as well as giving something back to the community. Fort Rosalie has been deployed in the Caribbean as part of Atlantic Patrol (North) (AP(N)) since the beginning of December, carrying out a number of official duties (e.g. relating to the recent UK/Caribbean Forum in Grenada) and activities related to drug interdiction. She has made stops in the United States, Jamaica, Grenada and now Grand Cayman. It has a crew of 149, including 10 women. She is captained by Captain Ross Ferris,who was born in 1954 in Feock in Cornwall. He joined the Royal Fleet Auxiliary in 1972 as a Deck Cadet, initially aboard TS Worcester at Greenhithe on the Thames. Built by Scott-Lithgow, Greenock the ship entered service as RFA Fort Grange in 1978. Her name was changed to RFA Fort Rosalie in 2000 to avoid confusion with RFA Fort George. When fully laden, she displaces 23,384 tonnes and with her Scott-Sulzer RND90 22,300 horsepower main engine, can achieve speeds of up to 22 knots. She is fitted with a bow thrust unit for slow speed maneuvering. She can replenish warships and other RFAs at sea from a cargo of stores, victuals and ammunition. The flight deck is capable of operating four Westland Sea King helicopters and when carried, up to 45 Royal Navy air crew are embarked. The present Fort Rosalie is the second to bear the name. The first Fort Rosalie was a WW2 standard ship built by United Shipyards Canada. She entered RFA service in 1945 and served until 1973. Fort Rosalie served in the Falklands Campaign in 1982, Operation Desert Storm 1991 and Operation Telic 2003. Organisers said the finalist has been selected from a large group of impressive nominations that were delivered by the community late in 2011. 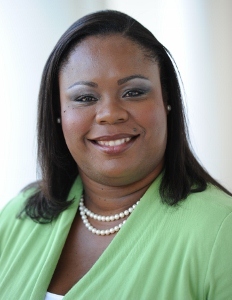 “The YCLA selection committee was presented with an almost insurmountable task; a task to identify five finalists out of so many suitable candidates who embody the mantra of the Young Caymanian Leadership Award. The five finalists are certainly all upstanding young leaders in our community,” said Jonathan Tibbetts, Chairman of the Nomination Sub Committee. and questioning the submissions. “The five finalists were selected for their dedication to growing our islands and young people; their discipline in their careers and volunteerism; and their desire to change the islands for generations to come,” he added. Now it’s down to the Honorary Board of Directors who will judge and score the five finalists via a secret ballot based on video interviews and their achievements. Any of these board members with close ties to any of the five finalists withdraw themselves from this final process. The name of the recipient has always been a well-guarded secret until it is announced live during the telecast. 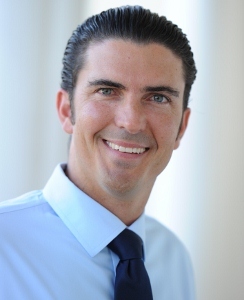 Previous recipients of the YCLA are Olivaire Watler in 2000, Dax Foster in 2001, Sara in Collins in 2002, Steve Blair in 2003, Cindy Scotland in 2004, Jonathan Tibbetts in 2006, Canover Watson in 2007, Stephen Ryan in 2008, Elroy Bryan in 2009, Collin Anglin in 2010 and Natalie Urquhart in 2011. According to the biographies supplied by the YCLA the finalist come from a diverse range of backgrounds and include a lawyer, an engineer, a civil servant, an accountant and a writer. (NBC): Puerto Rico, plagued by iguanas for years, is taking a violent stand against the ubiquitous reptiles. The government is proposing an iguana eradication project that would both eliminate the long-time nuisances, and bolster the territory's lackluster economy by exporting the reptiles' meat for as much as $6 a pound. "That is a lot more than chicken," said Daniel Galan Kercado, secretary of the Department of Natural Resources. "It has great economic potential." The reptiles have cost the U.S. territory hundreds of thousands of dollars annually by sunbathing on San Juan's airport runways. They disrupt traffic and cause power outages by building nests near power plants and wrecking building foundations by burrowing holes underneath them. 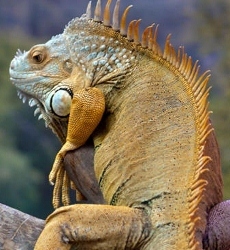 The Department of Health approved Galan's plan to train volunteers to capture live iguanas and bring them to a processing center where they can be killed and prepared for export. The complete plan is expected to be finalized by May, when it will be presented to several government agencies for final approval. (CNS): Three masked armed men made off with a small amount of money and a white Honda Odyssey motor vehicle during an overnight robbery. 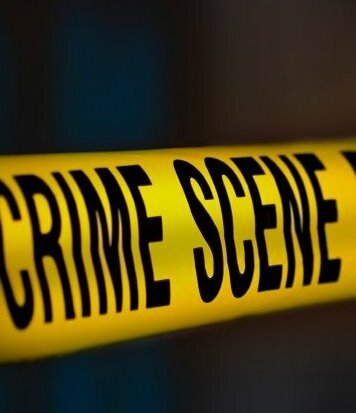 A spokesperson for the RCIPS said that officers were called to an address in Palm Dale, George Town at around 00.30 am on Tuesday morning where a 35 year old man and his 32 year girlfriend were robbed by the three masked men at their home. One suspect was armed with a handgun, the second with a machete and the third was carrying a knife. Alongside the undisclosed sum of cash the robbers made off with the car registration 142 696, which was parked outside the victims’ house. No shots were fired and no one was injured in the incident. Police noted that the plate number shown above could have been removed since the theft of the vehicle. 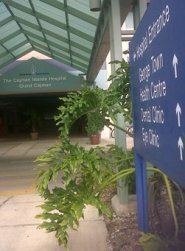 (CNS): The Caring for Life Foundation created to support the local health care has begun a campaign to raise money to buy much needed equipment and supplies for the Cayman Islands Health Services Authority. The foundation has developed an interactive website, www.caringforlife.ky, where donations can be made securely online with the help of Scotiabank which is donating banking and processing services. 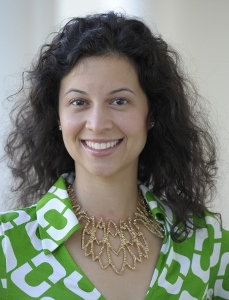 “The goal is to facilitate the fundraising process by making it easy for Cayman's residents, as well as international donors, to contribute any amount they wish,” says Caring for Life Foundation Chairperson, Sharon Diaz of Scotiabank. The organisers have also begun a television campaign sponsored by WestStar TV to explain the importance of the foundation, show real-life testimonials and invite viewers to donate and contribute to improving the level of care at Cayman Islands hospitals. "We all want to be able to count on excellent medical care whenever we or our loved ones need it,” says Jackie Hansen, member of the Caring for Life Board of Advisors. “Going overseas for treatment can be costly and disruptive to families, not to mention the critical time that can be lost. By reaching out and asking all residents to give what they can, here and there, even if it is only a small amount, we know there can be a multiplier effect. If everyone gives a little, we'll end up with a lot." A special fundraising initiative is being launched with the help of local supermarket Foster's Food Fair, where shoppers can donate to the Foundation right at the register when paying for their groceries. This campaign will run through February and March. "We always say 'At Foster's Food Fair We Care', and we hope to demonstrate this by partnering with the Caring for Life Foundation. 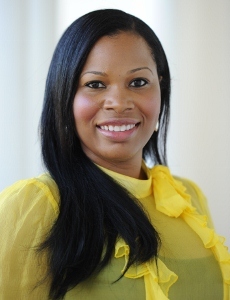 Their success will impact all of us," says Ayiesha DaCoteau, Marketing Manager at Foster's. Scotiabank is also onceagain the key sponsor of the foundation’s annual Golf Tournament this Friday, 10 February, at North Sound Golf Club. 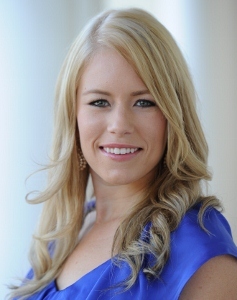 “There is limited space available for teams to sign up and we welcome any companies that wish to be added as an event sponsor for this always-exciting event,” says Sarah Hobbs, Deputy Chairperson of the foundation. Other supporting sponsors of the tournament this year are: CUC; Deloitte; Conyers Dill & Pearman; Digicel; Walkers; AL Thompson; BDO; Bodden & Bodden; and Five Continents. Anyone wishing to be a part of this year’s event can contact: Jacqueline Forrester at: jacqueline.forrester@scotiabank.com. The Foundation’s Board of Advisors is dedicating the launch of these initiatives in loving memory of Sharon Hurlstone, one of the Foundation’s Founding Board members, who passed away last week. Since it was first launched, the foundation has supported a number of projects including the purchase of equipment to test the hearing of all infants born at the Cayman Islands Hospital as well as other needed diagnostic equipment.